Be sure to catch our Nourish Column in the winter edition of Breast Cancer Wellness Magazine. You can read it online by clicking the magazine cover. On the University of Vermont's Across the Fence television show Chef Curtiss shares with Judy Simpson strategies for everday healthy cooking. Chef Curtiss prepared his Turkey Breast au Poivre, along with some Hearty Winter Greens with Bue Cheese and Pomegranates and Dark Chocolate Dipped Apricots with Sea Salt. Across the Fence is the longest running daily farm and home television program in the country. Across the Fence is a 15 minute program produced by University of Vermont Extension. The program airs weekdays at 12:10 pm on WCAX TV, Channel 3. On the University of Vermont's Across the Fence television show Chef Curtiss shares with Judy Simpson the role nutrition and healthy cooking can have when facing breast cancer treatment and recovery. Chef Curtiss prepared his Thai Garlic & Pepper Chicken, a simple, healthy and quick recipe for cancer patients. Chef Curtiss Hemm and Dr. Kim Dittus, Hematologist/Oncologist at Vermont Cancer Center and Assistant Professor, University of Vermont College of Medicine, discuss the role of healthy cooking, balanced nutrition and exercise have when you face breast cancer. Pink Ribbon Cooking is proud to become part of the Breast Cancer Wellness Magazine community. "NEW addition to the Breast Cancer Wellness Magazine - Chef Curtiss Hemm, Founder of Pink Ribbon Cooking is our newest contributing writer for the magazine. This cause became very important to Curtiss when his wife was diagnosed with breast cancer. We are thrilled to have Curtiss on board - Curtiss brings the joy of food and nutrition to a new level... to a healing level!" Breast Can­cer Well­ness Mag­a­zine offers great sto­ries of Inspi­ra­tion, infor­ma­tive arti­cles on treat­ment, many dif­fer­ent avenues for help and support. A one year sub­scrip­tion is only $15. Sub­scrip­tion also includes access to spe­cial con­tent here on the Breast Can­cer Well­ness Web­site, and our newslet­ter for FREE! Pink Ribbon Cooking is proud to be a part of The Pink Paper. Through monthly recipes and blog entries we will work together to build a community of survivorship that is delicious and healthy! Chef Curtiss shared a simple and unique salad with organic oranges, arugula, avocados, red onion and basil. Caroline Kehne, Editor at Northern Home, Garden and Leisure Magazine shares a great piece about Pink Ribbon Cooking in the February 2013 edition. There is a digital download available from their site as well. Part 2 of our story with Courtney Kabot and WPTZ News Channel 5. Courtney visited the Pink Ribbon Cooking studio and we cooked a variety of dishes from our signature eCookbook. Courtney Kabot from WPTZ News Channel 5 visited the Pink Ribbon Cooking studios. We cooked a variety of simple and healthy recipes and discussed the importance of diet as an element of prevention, survivorship and personal wellness. Take a foray into the Pink Ribbon Cooking studio as Amy Krester from Strictly Food for Thought Magazine and Jerry Haley from the Foundation of CVPH share some food, conversation and good times. Even Reese made it into the magazine! Thank you Amy for a great article! To join Pink Ribbon Cooking and to help support the Foundation of CVPH as they renovate the cancer rooms click here. Taking a Southeast Asian staple and making it feel right at home in your kitchen. Along the way we transform this into an everyday simple and healthy sandwich for home, the office or at your next party. This recipe was even high five worthy! See for yourself just how good it is. Here is our BÃ¡nh MÃ¬ recipe. With Valentine’s Day nearing it is time to focus on something decadent, luxurious and pleasurable. So why not try our simple and healthy, yes healthy, dessert. With the dark chocolate and the olive oil we have transformed this once sinful treat into an everyday simple and healthy recipe. See how delicious it is. Pink Ribbon Cooking was joined by Dr. Micelle Sowden, Surgical Oncologist at Fletcher Allen, for our grilled skirt steak with salsa and for an interesting and delicious baked sweet potato. Dr. Sowden offered some great insight on the importance of food and diet when it comes to cancer. Check out these simple, healthy and delicious recipes. Check out our simple Christmas side dish we prepared on WCAX The 30 with Mike and Kristin. The USDA notified Pink Ribbon Cookingâ„¢ that they now can be recognized as a Community Partner with USDA/CNPP within their Nutrition Communicators Network. This is a great recognition that acknowledges Pink Ribbon Cookingâ„¢‘s commitment, message and delivery of our nutrition goals, healthy cooking strategies and overall concept. For more information on the Choose My Plate program Click Here . Watch Gina and Chef Curtiss from Pink Ribbon Cookingâ„¢ prepare a simple & healthy Red Grape Salad. Watch Kristin and Chef Curtiss from Pink Ribbon Cookingâ„¢ prepare Swordfish with Greek Yogurt Sauce. Watch Gina and Chef Curtiss from Pink Ribbon Cookingâ„¢ prepare its signature 20 Minute Vegetable Soup. Pink Ribbon Cookingâ„¢ is proud to join forces with the Amercian Cancer Society by being a Survivor Recognition Sponsor at the 2012 Making Strides Against Breast Cancer of Chittenden County, Vermont. For more information on this great event Click Here. 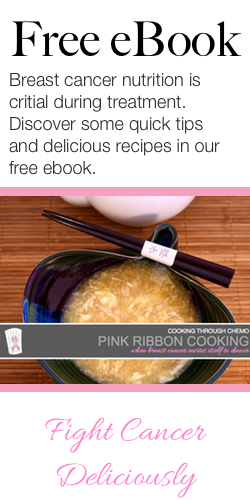 Our innaugural eBook, Pink Ribbon Cookingâ„¢, Simple & Healthy Recipe When Breast Cancer Invites Itself to Dinner is available through our Online Store. We also built an iPad App of the book to take advantage of the iPads functionality within the kitchen. Like all Pink Ribbon Cookingâ„¢ recipes the recipes are simple and healthy, they are all accompanied by brilliant photos of the dishes and each recipe has a full nutritional analysis and some personal notes from Curtiss. For more information or to purchase the iPad App please Click Here. Both the eBook and the iPad App feature a full section on best practices for cooking through chemo, as well, Curtiss offers advice to the support team of friends and family that choose to share a meal with someone in treatment. Watch Chef Curtiss from Pink Ribbon Cookingâ„¢ prepare its signature 20 Minute Vegetable Soup at the Hope Lodge in Burlington, Vermont.